Confession time. There are times when my eldest daughter drives me a bit crazy. If this makes me a bad parent, then I have a feeling that the world is filled with bad parents. Not that everyone is annoyed with my eldest daughter (at least, I hope not). But kids have a tendency to know just how to push their parents’ buttons. With my eldest daughter, it is her dawdling. It’s true. She’s a dawdler. Anything she can do slowly in order to put off something that she doesn’t want to do, she does as slow as possible. Admittedly, the reason this probably annoys me so much is because it is a trait within myself that I dislike, but that’s (slightly) beside the point. In recent conversations with various family members, I’ve discovered that the word “dawdle” is semi-archaic. And though it is a perfectly apt word, it is one that is not much used in today’s parlance. That got me curious about the word’s origin. What I found out was pretty interesting. Dawdling is for the birds. Well, one bird specifically: the daw, also known as the jackdaw. 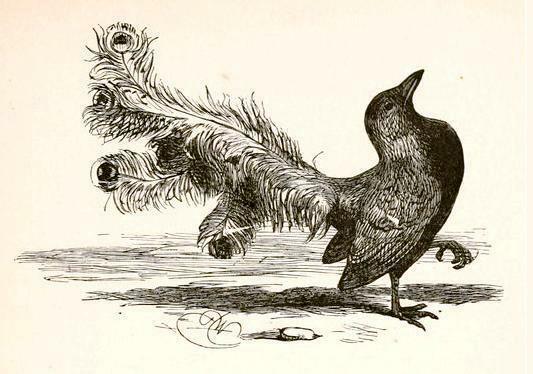 The jackdaw is a relative of crows and ravens, perhaps named for the sound that it makes. It is semi-famous for it’s role in Aesop’s fable about vanity in “The Bird in Borrowed Feathers“. Tradition holds that the daw was a silly bird with a slow walk. In fact, the daw’s name likely influenced the name of the walk for which it was famous, then known as daddling (think waddling, but with a d and pronounced differently). Soon, daddling was being used for anything done slowly, not just walking speed (don’t think that the irony of my daughter doing things slowly and my last name being Mosey (a type of slow walking) is lost on me). Over time, daddling became dawdling and apparently fell out of modern usage. Well, my wife and I use it still, but I wish we didn’t have to. I’d be so happy if I never had to say, “Stop dawdling!” to my daughter again. But then, she’d probably start saying it to me, so maybe I’ll just have to learn to accept it to some degree.